If perceptions of time and space can be altered by digitally capturing, storing and viewing images of the world, Daniel Crooks is a poet playing with the building blocks of electronic reality. Crooks uses computer technology to warp and distort video field recordings, stretching and melding together sequences until the final piece resembles a science-fictional world of elongated figures drifting through distended dimensions. Crooks’s videos are all the more fascinating since they are clearly derived from everyday encounters with trains, people in lifts, shopping malls or waves breaking on an empty beach. Crook’s use of computer post-production technology allows him to “time slice” raw footage into complex alterations of perspective and linear progression. His videos are rigorous explorations of technique, the artist spending many years developing and exploring his process, repeatedly returning to subject matter to impose a new formulation and achieve different results. Train No. 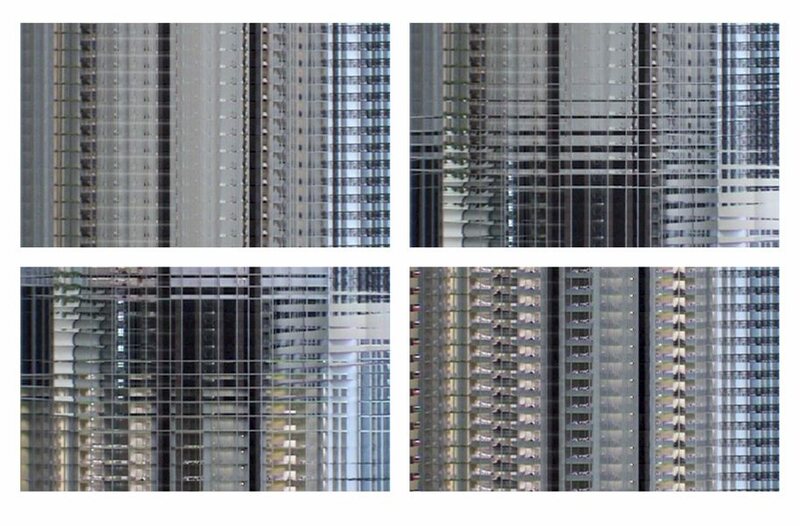 1 , a three-screen work, applied a grid-like time slice to a train passing from one screen to the next, the mosaic-like visual effect giving the impression of a regular and repeating pattern. In Train No. 9 (Shinkansen) , the time slice technique had been considerably refined and extended. Shot from the window of a train, the rolling landscape appears to have been distorted so that objects closest to the camera – buildings, people, passing rail structures – move the slowest, while objects in the middle ground and background stretch away in abstract whorls of distorted space. Another of Crook’s ongoing experiments are works that combine a moving camera with complex rearrangements such as shifts in vertical and horizontal movement, time lags in sections of the image and collapsing perspective. Pan No. 2 (One step forwards, one frame backwards),  combines images of pedestrians - in what appears to be a mall or a train station - with a blurred background of rapidly moving surfaces. Crooks video works have typically been exhibited alongside photographic prints that capture in static frames the elongated ribbon structures of the video’s moving images. In his Imaginary Object series, Crook’s videos negotiate sculptural like stillness in what is actually a moving image. Imaginary Object #1 and Imaginary Object #4 [both 2007] eliminates backgrounds and colour for ink-black voids in which white strands evolve into billowing and slowly unfurling objects. Selected solo exhibitions: One step forwards, one frame backwards, Sherman Galleries, Sydney, 2007. Daniel Crooks: Without Cutting or Tearing, Kings Artist Run Initiative, Melbourne, Time Slice, Lovebytes Festival, Sheffield, United Kingdom, 2006. Daniel Crooks: Train No.1, Level 2 Project Space, Art Gallery of New South Wales, Sydney , Daniel Crooks: A small section of something larger, Sherman Galleries, Sydney, 2 videos & 2 devices, Rijksakademie van Beeldende Kunsten, Amsterdam, The Netherlands, 2005. Selected group exhibitions: Experimenta Playground, BlackBox, Arts Centre, Melbourne, 2007. Wave Front: Australian Contemporary Art Scene, Tokyo Wonder Site, Shibuya, Tokyo, Japan, 2006. The Exchange of Viewpoints, Remo, Osaka, Japan, Anne Landa Award, Art Gallery of New South Wales, Sydney, The Computational Sublime, Blur + Sharpen, University of California, 2005. Selected publications: Time Lord, Australian Art Collector, April–June 2007. Eternal Beautiful Now, Artlink, September 2007. Art movement: Explorations of motion and change, Eyeline, no. 63, winter 2007. Moving images: Anne Landa Award for video and new media arts, Look, November 2006. Video in the expanded field: Three recent examples of Australian video installation, Art & Australia, winter 2005.